Lately, unintentionally, I have found myself more and more often skipping the meat and choosing vegetarian or fish dishes instead. I haven’t really made a conscious decision about this, but I think it’s just because sometimes the amount of meat we consume as a society just feels a bit heavy. I’m nowhere near close to choosing to go vegetarian, don’t get me wrong, I love a good steak. Just sometimes I find eating a big meat heavy meal every day a bit much. 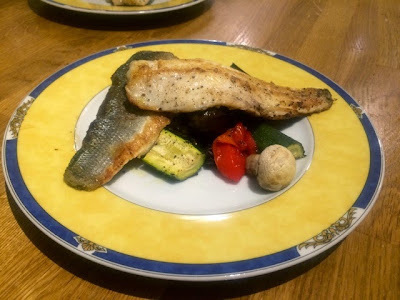 I’m perfectly satisfied by a good vegetarian dish and often I’ll choose to cook fish at home instead as it feels lighter, healthier and takes a fraction of the time to cook and/or prepare. I quite enjoy visiting the fish counter in the supermarket. When you’ve got a strict meal plan it can be quite liberating to go and just see what they’ve got. People often think the fish counter is the posh or expensive option, but that’s often not the case. There are always good deals on and if you’re a bit flexible the fish monger can often make recommendations if you’ve got a certain dish in mind and if you’re a bit intimidated they’re always willing to fillet something for you or prepare it exactly how you need it. I’d highly recommend visiting the fish counter near to closing time on a Sunday, they have some great bargains. 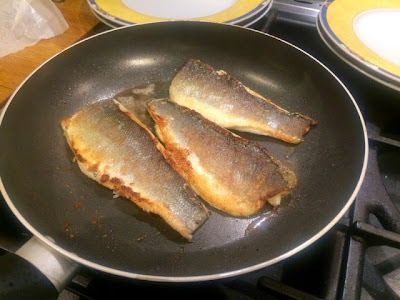 Whilst there are many different and exciting ways to cook your fish, sometimes one of the most satisfying is just to pan fry it so the skin’s nice and crispy, season it well and simply enjoy the flavour of the fish. 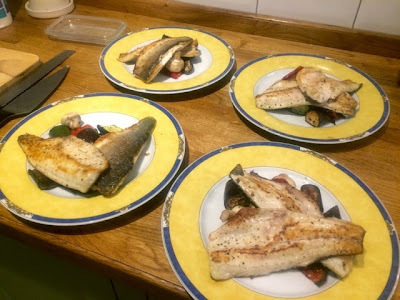 This is precisely what I did for these sea bass fillets I bought a few weekends back. 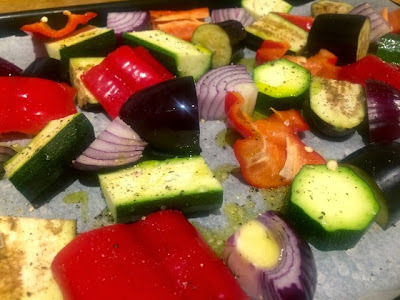 I adopted a similar approach with the vegetables I served with it, seasoned them well and roasted them as they were. There was so little effort put into this dinner, yet such a tasty and enjoyable end result. 2. 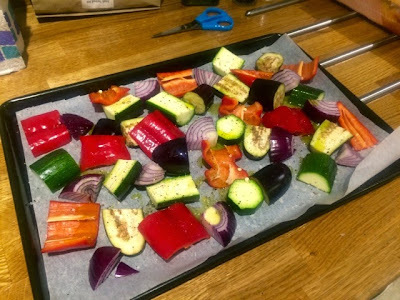 Line a baking tray with greaseproof paper and spread courgette, aubergine, pepper and onion chunks across it ensuring they’re evenly spread out. 3. Drizzle with olive oil and season generously with salt and pepper. 4. Place in the oven for 25 minutes. 5. After 25 minutes add the mushrooms to the tray and return to the oven. Cook the fish while the vegetables finish off. 6. Heat a little oil and a knob of butter in a large frying pan. Place fillets in skin side down, pressing down for a few seconds when they first go in to keep the skin from curling up. Season generously with salt and pepper and a big squeeze of lemon juice. Unless you have an enormous frying pan you’ll have to do this in batches. Keep cooked fillets on a warm plate covered in foil while you do the rest. 7. 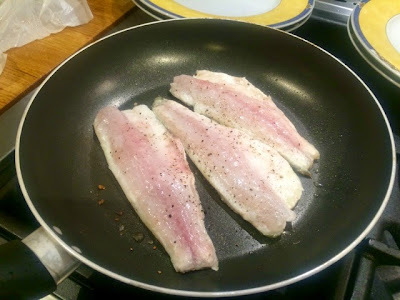 After a a couple of minutes when you can see there’s just a small amount of pink flesh left on top, flip the fillets over and fry for a further minute or so on the other side. 8. 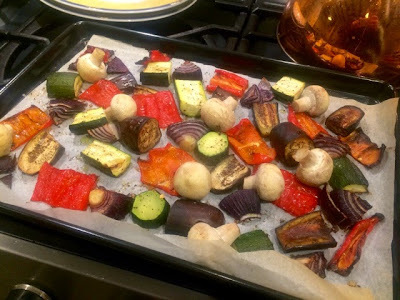 Remove vegetables from the oven. 9. 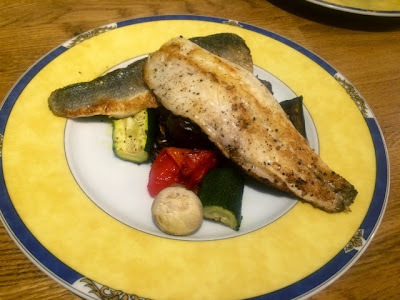 Dish the vegetables up evenly between four warmed plates and pile the two fillets of fish on top.